Karni Fort, Bambora a Heritage Hotel near Udaipur is today available to the discerning and adventurous traveller, to share in its past and partake of its present- the epitome of Rajput hospitality, princely comforts and Aristrocratic cuisines. The Karni Fort a Heritage Hotel near Udaipur has been sensitively restored to retain its ambience and yet offer modern conveniences. Of great interest is the whole process of conversation and restoration which the owners, Thakur Sunder Singh, his wife Thakurani Chanda Kanwar of Sodawas (Marwar- Jodhpur) and their Aristrocratic family, took up this challenging task, of converting this majestic Fort into an immaculate Heritage Hotel. Karni Fort Bambora a Heritage Hotel near Udaipur has 30 rooms, 10 suites and 20 deluxe rooms with airconditioning. These rooms have been tastefully done up, each having a distinct individuality and style. 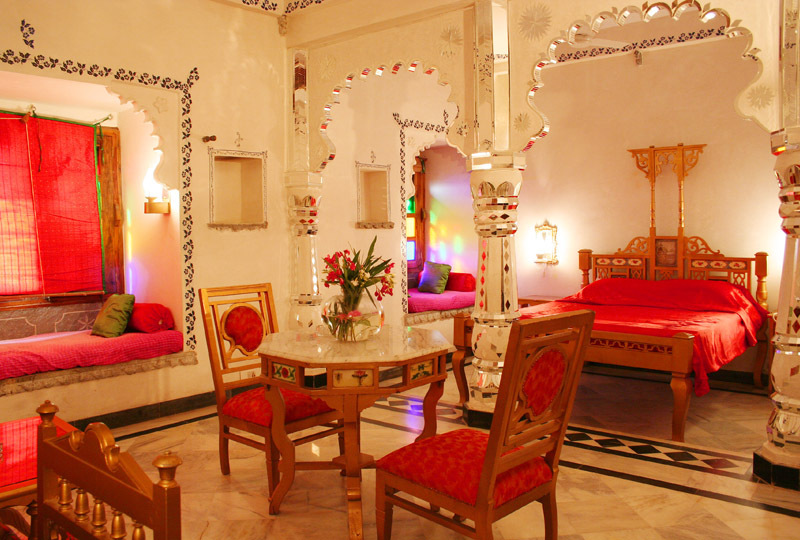 Karni Fort has exquisite Heritage furniture tastefully handpicked for each room. Each room at Karni Fort Bambora a Heritage Hotel near Udaipur has a breathtaking view of the scenery around.One can also have glimpse of the beautiful sunrise and sunsets through the large bay windows present in each room. Enjoy romantic meals in the balconies which are attatched to some of the suites at the Karni Fort, it is truly a exquisite and novel experience. The accomodation at Karni fort Bambora a Heritage Hotel near Udaipur can be the best described as an amazing blend of old charm with modern facilities. Ayurvedic Oil massage : on request at the Reception. Hamam on request ( This is an 18th Century Jacuzzi’). A tour of the museum and a glimpse of the Old Tunnel. Village walk, and a browse in the Baazar. Horse Safari in the tribal areas, and also a close view of thier dwelling and culture. Conferences for upto sixty people can be arranged at the Karni Fort. A day excursion to Jaisamand lake, Rajasthan’s biggest man-made lake along with a picnic lunch. 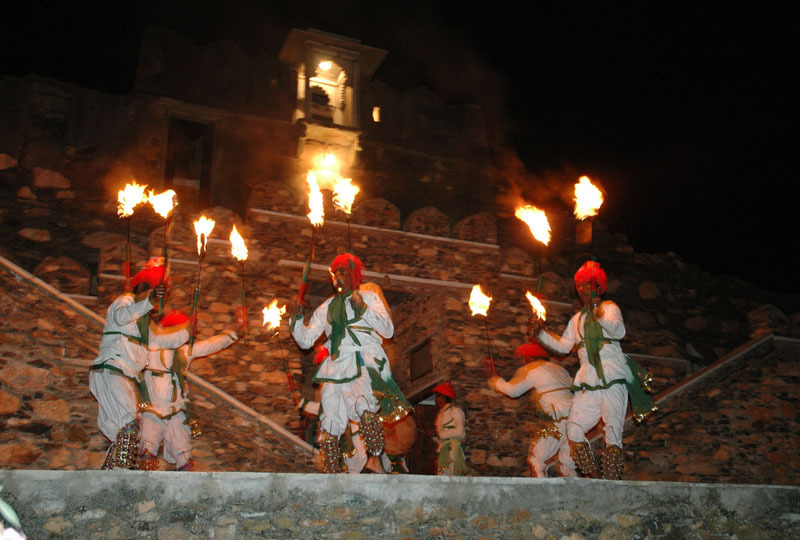 While you are there, you can also visit the famous ‘Ruthi Rani Ro Mahal’. For Keen bird watchers, at times, one can see, King Fisher, Beeaters, Tree Pie, Partridges, Swallows, Kites & Grand Indian Peacocks in the Fort Premises. The beautiful marble pool will always bring back Karni Fort into your memory. Guest can change into their swim-wear by the pool side changing room, towels are available at the pool. To keep children occupied, we have indoor games. Last but not the least, one can also do a full day sight-seeing of Udaipur City, with a special lunch at the Lake Palace Hotel, and return at tea time to Bambora to see the glorious sunset. An 18th Century Karni Fort Bombora a Heritage Hotel near Udaipur has uniquely developed into a traditional Heritage Hotel with an extra touch of authenticity. This magnificient Fort lies 45 kms to the fabled city of lakes Udaipur. It stands just off the highway which connects Ahmedabad to Chittorgarh. There are several acctivities one can enjoy during the time at Bambora. Most popular being the Horse Safari in which one rides into the the tribal areas meets with people of various local tribes, and gets a close view of the dwelling and culture of these people who seem so far removed from the urbanisation around them. The gala evenings with traditional dancing and singing fills the evening air with romance . The cuisine served is authentic Rajasthani fare. A visit to the 11th Century Hindu Jagat Temple, also known as the Mini Khajuraho of Rajasthan is highly recommended.The Sitla Mata sanctury is also another attraction. Day excursions to Chittorgarh or to the city of Udaipur can be arranged, both cities have a great historical significance in Indian history and are worth a visit.